A NEW frontier is opening up through the application of wireless technology and measurement instrumentation to provide data that was previously not available to enable enterprises in a wide range of industries to operate more safely, reliably and profitably. Pervasive Sensing is designed to extend a company's vision beyond traditional process control and safety systems to provide real time information on business-critical areas such as site safety, reliability, energy efficiency and environmental protection. Emerson Process Management estimates that over the next 10 years, the Pervasive Sensing market will more than double the existing US$16 billion traditional measurement market. No-maintenance devices that are accurate, calibration-free and have lifetime reliability. "Pervasive Sensing is not a product, but an outcome that leads to measurable and significant improvements with high reliability and high accuracy. A new level is coming to drive costs down through non-intrusive sensing utilising automated algorithms," Karschnia said. "The cost and difficulty of implementation has historically hindered the uptake of Pervasive Sensing, but now there are significant advances available in a whole range of areas. These include innovative sensors, wireless communications, non-intrusive installation, power technologies, advanced analytic capabilities, embedded expertise, and mobile and location technologies. "The Emerson Pervasive Sensing focus is on providing the ability to modify and change systems through actionable information and solutions that are easy to use, with the aim of reducing issues such as plant slowdowns and shutdowns, helping to reduce risks to delivery on time, and avoiding environmental issues and fines. 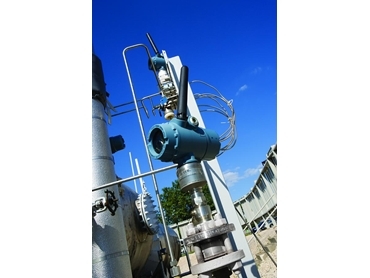 "Safety and environmental compliance are key challenges to be addressed by Pervasive Sensing - from monitoring of pump failures in the field to steam loss in the food processing industry." According to Karschnia, advances in wireless and sensor technologies, as well as installation techniques, mean that companies can now install non-intrusive wireless technology together with a network of affordable easy-to-use sensors to continuously monitor all aspects of operations, which in turn enables improved decision-making and more rapid action. "This approach to broader and deeper data collection is able to deliver a new class of business-critical operational measurements that can be managed separately from process automation functions," he said. Based in Perth, Emerson Automation Consultant, Jon Weidenbaum, says Pervasive Sensing is a technology enabler that facilitates unconstrained access to process and asset data that was originally dictated by the physical layout of a plant and the technology to support it. "Now technology has moved on and there is an escalating need for increased data across all industries which is largely driven by a top down push for greater operational efficiency, asset optimisation, and improved OH&S," he said. "Industries such as oil and gas, power, water, mining and metals all have assets located in remote areas and they all experience associated concerns about people's safety and environmental issues, which implies there is a unique need in Australia for Pervasive Sensing. "By utilising wireless technology for Pervasive Sensing, additional data can be gathered without impacting the current operational system and production. Monitoring and collection of data via Pervasive Sensing can enhance asset availability and personnel safety, saving thousands of site visits per year to these remote locations. "One thing that is certain about today's world is that there is no certainty on what data the customer may require tomorrow. Typical drivers for the growing need today are environmental and regulatory demands, asset optimisation, health and safety, process efficiency and cost sensitivities. "Pervasive technology through wireless field implementation provides a flexible approach to react and expand these future needs whilst minimising the impact to current operations and production. "Typically in remote facilities, monitoring of assets and consumables is often manual and can be as infrequent as every 2 to 3 months due to the remoteness of the sites. "In this scenario, the question should be asked as to what the accumulative cost and damage could be to a company for not having the asset monitored and protected for this period of time." Weidenbaum points out that the consequences could be enormous, including compromises to the integrity of the field asset, impact to the environment, and damage to the reputation of the operator. He says that with wireless Pervasive Sensing in place, companies are forewarned of potential operational and asset issues in real-time and can make quick decisions to take corrective action. "With pervasive technology, a better understanding is provided of the condition of assets and the process performance so that a more predictive, risk managed approach can be implemented for timely intervention, and arrival on site with the correct equipment or replacement parts. "A pervasive network will typically consist of wireless enabled instrumentation together with remote and distributed remote telemetry units to provide seamless connection for the assets in the site proximity. Weidenbaum says that the move to risk-based management together with the emerging need to refocus the well head as a collection of mobile assets rather than a fixed site, will drive the future demand for Pervasive Sensing, especially in the unconventional oil and gas arena (coal bed methane and shale gas).